Harvard UP's upcoming A New Literary History of America. The Book Show of the Australian Broadcasting Corp. looks at the new literary magazine The Death Mook, which is all about the last hurrah, including "corpse tourism." New: Journal of Art Crime. Art thefts are, sadly, big business, and the subject of reader interest, as can be seen in the reception of R. A. Scotti's Vanished Smile: The Mysterious Theft of Mona Lisa (2009). Now the nonprofit Association for Research into Crimes Against Art (ARCA) has announced the establishment of an academic journal, Journal of Art Crime, that will explore the subject, its history, and its aftermath. Although ARCA's Web site states that the first issue was due to be published in spring 2009, there are no articles, abstracts, or a table of contents posted. Black Squirrel Books republishes Jim Tully. Black Squirrel Books, an imprint of Kent State University Press that focuses on Ohio writers and culture, has reprinted Jim Tully's Circus Parade (1927) and Shanty Irish (1928). The press's Web site claims that Tully (1886–1947) "is credited with originating the hard-boiled writing style." I regard that assertion with skepticism, as Carroll John Daly generally receives the credit for publishing the first hard-boiled story, "The False Burton Combs," in 1922 and "It's All in the Game" with the first hard-boiled detective in 1923. There will be some prescheduled posts over the next few days, although the Bunburyist might eventually need to go on temporary hiatus. My remarkable mother has passed away. Suffice for now to say that she was a child of the Depression with six siblings, raised three sons and three daughters after her husband died at age 49, and believed there was nothing her children could not do. Viewing and service on Tuesday, July 28th; obituary here. 118 quarts of Scotch—and more. Over on Yale's Room 26 Cabinet of Curiosities, H. L. Mencken provides a unique book inscription (and bibulous assessment over a three-year period) to writer-photographer Carl Van Vechten: "118 quarts of Scotch..."
Chesterton, Christie, Fleming results from Sotheby's July 14th auction. Frank McCourt, Crime and Punishment, and the American way of detection. "There's nothing to do but go back to my room, listen to the radio, read [Dostoevsky's] Crime and Punishment and fall asleep wondering why Russians have to drag things out. You'd never find a New York detective wandering around with the likes of Raskolnikov talking about everything but the murder of the old woman. The New York detective would nab him, book him and the next thing is the electric chair in Sing Sing, and that's because Americans are busy people with no time for detectives to be chatting with people they already know committed the murder." Baroness Orczy, Josephine Tey this week on BBC Radio 7. Baroness Orczy's armchair sleuth The Old Man in the Corner is featured this week on BBC Radio 7 in The Teahouse Detective. Also airing: Inspector Alan Grant finds a dead man in the Highlands in Josephine Tey's The Singing Sands. Go here for the schedule or to listen. New essay collection on John Buchan. Pickering & Chatto has just published Reassessing John Buchan: Beyond The Thirty-Nine Steps. It is edited by University of Ghent professor Kate Macdonald, author of John Buchan: A Companion to the Mystery Fiction that I edited for McFarland. Essays examine areas such as Buchan and the Boer War, Buchan and Joseph Conrad, Buchan and the supernatural, and Buchan and Islam. Despite the collection's subtitle, there's one essay on "Tracing The Thirty-Nine Steps." Jane Aiken Hodge, the American-born daughter of poet Conrad Aiken and sister of the late writer Joan Aiken, died at home on June 17th. The funeral is set for July 21st in Sussex. Hodge wrote a number of historical fiction works and some mysteries, such as Maulever Hall (1964), A Death in Two Parts (2000), and Deathline (2003), as well as a life of Jane Austen and a fine biography of Georgette Heyer, The Private World of Georgette Heyer (1984). British author and avid sailor Ralph Hammond Innes, known for thrillers such as The Blue Ice (1948) and works such as The Wreck of the "Mary Deare" (1956), was born today in Horsham in 1913. His writing career began far from promisingly: his first four novels, according to Contemporary Authors, only reaped a total of £120. He began to garner attention with Attack Alarm (1941), which was based on his experiences as a gunner during the Battle of Britain, and other novels were eventually adapted for film or television (for example, Fire in the Snow , The White South , Campbell's Kingdom , and The Doomed Oasis ). He was made a Commander of the British Empire (CBE) in 1978 and died in 1998. Cornell Woolrich this week on BBC Radio 7. This week BBC Radio 7 features Cornell Woolrich's "It Had to Be Murder," the short story that was the basis for Alfred Hitchcock's Rear Window. Go here for the schedule or to listen. The burial club: One organization that even Groucho would avoid. In this interesting podcast from the National Archives-UK, Audrey Collins explores nineteenth-century burial clubs or "friendly societies"—sort of like a Christmas Club for poor people to pay for the funerals and burials of themselves and their nearest and dearest. Except these friendly societies were not so friendly; rather, they were hotbeds of fraud (e.g., people dying several times, people reported dead who were alive, imaginary people reported dead) and murder (family members disinclined to wait for the death benefit). 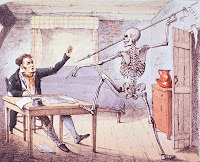 About the image: "Death found an author writing his life. Author protests the intrusion of Death before writing is complete." Edward Hull, Dec. 1827. National Library of Medicine, History of Medicine Division. Jessamyn West of librarian.net highlights (with photos) the clever advertising campaign (via trucks) by Kansas's Johnson County Library System. Fond of Freddy and friends. The Overlook Press blog notes that Nick Kristof, a New York Times Op-Ed columnist, has selected the Best Kids Books Ever, including Freddy the Detective (1932) by Walter R. Brooks, the Hardy Boys by the Stratemeyer Syndicate, and the Alex Rider series by Foyle's War creator Anthony Horowitz ("things keep exploding in a very satisfying way"). The way we live now—and then. The Likely Stories blog is delighted that Newsweek selected seemingly fusty Anthony Trollope's The Way We Live Now (1874) as its top "What to Read Now" pick. Why? TWWLN features "a swindling financier" and is "scathing in its examination of greed." Sound familiar, Bernard Madoff and Samuel Israel III? The prescience and acuity of our predecessors can be quite striking. Look at Trollope's He Knew He Was Right (1868)—obsession, jealousy, and stalking (which Trollope based on Othello), not to mention an early appearance by a private detective. More obsession, jealousy, and stalking in Dickens's Our Mutual Friend (1864),as well as, in the words of Henry James, "a couple of elegant swindlers." Dickens's Little Dorrit (1855–57) also outlines a Ponzi scheme, long before the birth of Charles Ponzi. For more on the subject, see Erin Wells's "Swindlers and Society in Dickens and Carlyle." About the photo: Anthony Trollope. New York Public Library. Flashman this week on BBC Radio 7. Fans of the late George MacDonald Fraser, rejoice: This week BBC Radio 7 features the 19th-century adventurer Harry Flashman in Flashman at the Charge and Flash for Freedom. Go here for the schedule or to listen. At left, a magnet from The Onion's online store. Books That Inspired American Film Noir. July's Fine Books and Collections looks at Kevin Johnson's The Dark Page: Books That Inspired American Film Noir, vol. 2 (covering the 1950s). Works mentioned in the piece include Fredric Brown's The Screaming Mimi (1949); Niven Busch's The Furies (1948); Theodore Dreiser's An American Tragedy (1925); Dorothy B. Hughes's In a Lonely Place (1947); Mickey Spillane's Kiss Me, Deadly (1952); and Nathanael West's Miss Lonelyhearts (1933). 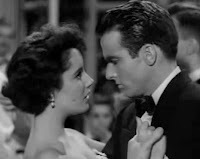 About the image: Elizabeth Taylor and Montgomery Clift in A Place in the Sun, dir. George Stevens, 1951; adaptation of Dreiser's An American Tragedy. Greene makes some green, and other book auction results. At Bloomsbury's June 23rd auction of books and manuscripts, a signed first edition of Graham Greene's This Gun for Hire (1936; reissued as A Gun for Sale) sold for $1500; and a hodgepodge lot of first-edition mysteries went for $600. They included Nigel Morland's A Rope for the Hanging (1939), Joanna Cannan's No Walls of Jasper (1931), Manning Coles's A Toast to Tomorrow (1941), and Elisabeth Sanxay Holding's The Girl Who Had to Die (1940). One note on Cannan: She was the sister of World War I poet May Wedderburn Cannan; mother of children's authors Josephine, Diana, and Christine Pullein-Thompson; and a friend of Georgette Heyer.